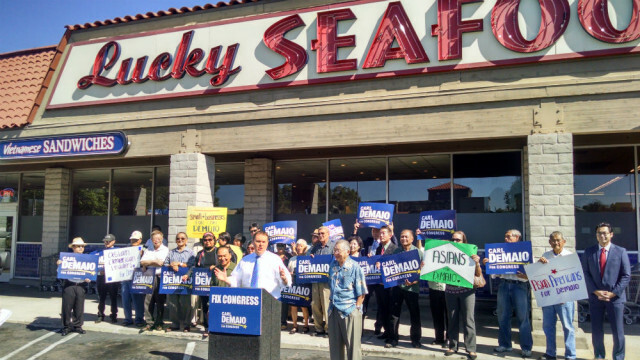 With the popular Lucky Seafood Super Market in Mira Mesa as a backdrop, Carl DeMaio on Tuesday received endorsements from leaders of San Diego’s Asian-American community in his race for Congress. “I believe in inclusiveness. That’s why I’m willing to take on my own party,” said the former City Council member who is challenging Rep. Scott Peters to represent the 52nd District. Tom Hom, the first Asian-American member of the City Council, praised DeMaio’s effectiveness on the council in endorsing him for Congress. “I highly endorse Carl DeMaio to represent this district in Congress,” he said. On Saturday, Peters received endorsements from state Controller John Chiang and local leaders of the Asian and Pacific Islander community at a rally at Pangea Bakery Cafe in Kearny Mesa. The 52nd District covers much of central San Diego County including Poway, Coronado and large portions of the City of San Diego. The race between Peters and DeMaio is considered one of the closest nationwide.